It is a renowned wine production area with many small family-owned wineries. On the road between McLaren Vale and Kangarilla, the McLaren Flat township is where the Adelaide Hills come down to meet the vales. 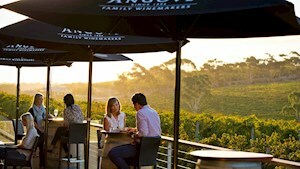 It is a renowned wine production area with many small family-owned wineries with cellar doors located here. The area also produces a variety of delicious berries and stone fruits, some of which may be purchased roadside when in season. See what people are posting about McLaren Flat.